I have a flame point Siamese, he is wonderful, he loves me. He hides when there's other people around but he licks my eyelids at night and loves to go in bags. He also likes hair ties a lot. He sleeps with me every night. When people come over they see my other cat and want to see Vanilla, he is very nice and will never scratch anyone. He does tricks - sit, stay, stand, and high five. We live on the Rosebud Sioux Indian reservation in South Dakota. In September 2013, at the gas station, as I opened the car door something white jumped in and started to purr and make himself loveable. It was a pure white kitten with striking blue eyes. I took him home and have had him ever since. He was about three months old when he came to live with us. Jimmy is now almost three, very affectionate and loves to sleep with me. I adopted him from a shelter a few weeks after my cat J.C. died at 16. I was told he was going to be euthanized if he went back to the shelter for lack of space. I never had a more loving cat. As soon as my alarm goes off he puts his paws around my face and licks my lips and eyes till I wake up. I can't imagine how anyone would turn this incredible cat into a shelter. Until I did some research on his breed I didn't think this was normal behavior. So glad to have found this site. Seems to me, we're starting to get a little group of flame points here. First Adriana's Dara, (red point is another name for flame) then April's Jazz, and now Destiny's Vanilla! Lovely kitties, all of them. Way to go, guys! That is so wonderful! Would love to teach my kitty to high five as well. Well done! And he really is beautiful! 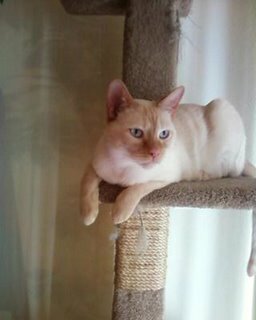 Thank you, Destiny, for your photo of Vanilla - he's a gorgeous flame point Siamese. Hope you have many happy years with Vanilla - that's a lovely name for a Siamese cat!